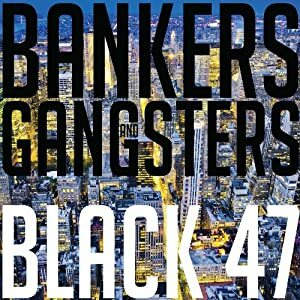 After their grimly topical 2008 CD Iraq, which emphasized Kirwan's insightful lyrics and fierce political dedication, Bankers and Gangsters brings the Black 47 rhythm and horn sections, and the band's devilish sense of humor, front and center. The result is a great dancing and drinking record, worthy of a band whose live shows (as documented in the Home Team Productions DVD Black 47 New Year's Eve Live at Connollys) are legends of riotous joy and Irish flavored madness. It's a St. Paddy's Day gift to all Celtic dervishes scattered through barrooms and ballrooms everywhere across America. Like their earlier roots-rock album Green Suede Shoes, Bankers and Gangsters keeps the reels reelin' and the rock rollin'. It's one wild party, with Kirwan blasting along on his Strat over the melodic cacophony of Geoff Blythe's fearless sax, Fred Parcell's jazzy trombone and Joe Mulvanerty's wild uileann pipes and flutes, with Joe "Bearclaw" Burcaw, the latest recruit to the Black 47 crew, keeping it all grounded and real with his muscular bass playing while Thomas Hamlin's edgy drum style keeps the beats flowing in mysterious, infectious ways. That's not to say that Larry Kirwan's witty, thoughtful lyrics are neglected. He's doing some his best writing yet, and he delivers his words with passion and fire. When Kirwan adopts the persona of the half-mad historic Irish war chief "Red Hugh" O'Donnell, you can feel the blood boiling in the legendary fanatic's heart. Kirwan did his research to come up with this song, and in the notes available on the band's web site, he remarks on the striking similarities between the sixteenth century Irish hero and the martyred leader of Afghanistan's anti-Taliban fighters, Ahmad Shah Massoud. Larry Kirwan always has an eye for the resonance of history and legend in contemporary events. The centerpiece of Black 47's Iraq was "Battle of Fallujah" which conjured eerie suggestions of epic ancient war-poems like The Illiad and The Tain. Here, in the title track he skewers the racketeer financiers who wrecked our economy while he keeps a satiric laughing roar alive and dancing, like a true savage Irish bard, visioning the dark of human greed and summoning the light of human joy. Turning and turning in the widening gyre, as Yeats might say. Indeed, Kirwan summons up the misty Irish spirits of Yeats and James Joyce themselves in a surreal tune named after both literary masters. And he name checks the likes of Lester Bangs, Jimi Hendrix and other rock n roll saints on "Long Hot Summer" and "The Lost Hendrix Tapes" while the band musically references The Kinks and seminal Irish glam-rockers Horslips on "Celtic Rocker," a hilarious send up of the musical sub genre which Black 47, admittedly, helped originate. "Rosemary (Nelson)" pays well deserved tribute to a brave, self-less lawyer slain during the not-yet-ended Irish Troubles, while "That Summer Dress" , "One Starry Night" and "The Islands" nod to the beauty of all women and the sweet pain of love, and seem destined to pull a nostalgic tear from the listener to water a pint of stout and red ale. Then Kirwan returns to lighter fare with "Izzy's Irish Rose," an uptempo venture into that cross-cultural musical territory recently explored delightfully by Mick Moloney on his own fine recent CD If It Wasn't for the Irish and the Jews. Black 47's unique take on klezmer music is not to be missed. The album closes with "Bas in Eireann" (To Die in Ireland), a song from "Transport," the intriguing Irish-Australia emigration- themed musical play which Kirwan has been working on in collaboration with novelist Tom Keneally. Author Kirwan is also releasing his latest novel, "Rockin' the Bronx" this month. It's a tale of music, romantic conflict, late night stands-and Irish inflected rock n roll. Sounds like a Black 47 bash, if ever there was one. © 2010 RootsWorld. No reproduction of any part of this page or its associated files is permitted without express written permission.